Listen to the Cancer.Net Podcast: Quitting Smoking After a Cancer Diagnosis, with Anthony Alberg, PhD, MPH, adapted from this content. If you or a loved one has been diagnosed with cancer, quitting tobacco use is one of the best goals a person can have to improve the chances of successful cancer treatment. Many believe that smoking caused their cancer and feel like they have brought this on themselves. Others believe that it is too late to quit and that the damage has already been done. People who use tobacco should not blame themselves for a cancer diagnosis or feel that nothing can be done to help them. Quitting can have benefits right away. 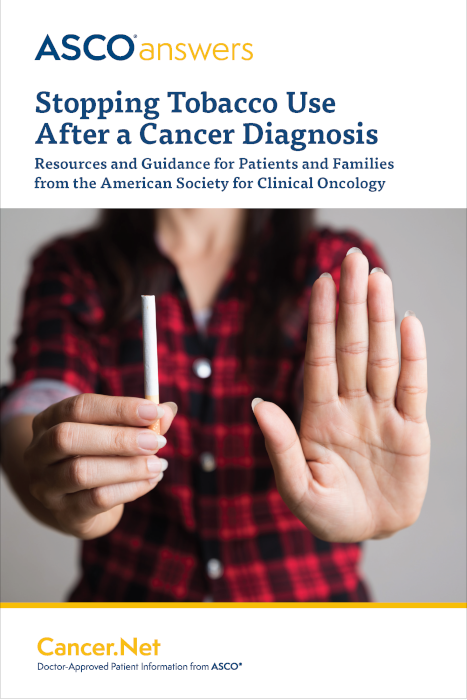 Download ASCO’s free booklet, Stopping Tobacco Use After a Cancer Diagnosis, as a printable PDF in English (20 pages) or in Spanish (22 pages). Order printed copies of the booklet in English from the ASCO University Bookstore.